Christopher Robin review: "A big, comforting hug of a film"
A low-key charmer, this lovingly-crafted, melancholic movie is a big, comforting hug of a film. Like the Hook of the Winnie-the-Pooh cinematic universe, Christopher Robin finds its protagonist – who should be forever preserved in childhood – all grown-up and unable to remember his adventures. It’s a delightful concoction that will work your tear ducts gently but consistently over its runtime. Better suited to nostalgic parents than restless infants, this is pared-back, old-fashioned family entertainment. 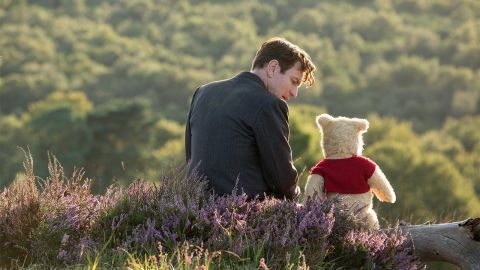 Where the recent Goodbye Christopher Robin focused on the harrowing effects A.A. Milne’s celebrated books had on his son, this Disney version of the story takes a more family-friendly approach. And as Disney actually owns the necessary rights, Pooh and his Hundred Acre Wood friends pleasingly appear in familiar form, as does all the key iconography you remember. Marc Forster’s film serves as an extension of the storybooks, quite literally in the economical opening montage, which shows what’s happened to Robin in the years since he was best pals with Pooh, Piglet, and Tigger. Boarding school, followed by World War 2 and a soul-crushing job in the city have turned Robin (Ewan McGregor) into an absent, overworked father, whose relationship with his wife, Evelyn (Hayley Atwell), and young daughter, Madeline (Bronte Carmichael), is hanging by a thread. When work causes Robin to miss a family weekend away, a walking, talking Pooh (Jim Cummings) arrives back in Robin’s life, and his brand of philosophical aphorisms might help Robin reclaim a shred of his youthful spirit and reconnect with his family. For a film with three credited screenwriters (and two more credited for the story), it has a surprisingly elegant simplicity to it: you could scribble the full synopsis on the back of a postage stamp. But within that simple framework, there’s much pleasure to be had. Everything seems crafted for a nostalgic glow, from the familiar voices to the Disneyfied vision of post-war London and the cartoonish supporting cast (Mark Gatiss is good fun as Robin’s loathsome boss). While there are some comic set-pieces and pratfalls, and it never goes that long without an animated animal on screen, this isn’t a Paddington-style laugh-a-minute romp. The tone is more Eeyore than Tigger, and the callbacks are subtle and muted: when the classic theme song returns, it’s in a low-key, wistful way. McGregor is on charming form (as are Atwell and Carmichael), ensuring that you root for Robin even though he’s a bit of a misery. But it’s really Pooh who’s the MVP here. You’ll want to hug him and use his soft fur to mop up your tears. A bittersweet delight.